Made of a heat-resistant, non-stick silicone material our socks will repel build-up of molten plastic. This really helps with sticky materials like co-polyesters and filled-composite materials that like to build up on nozzles. Very useful silicone socks: will keep your heater block clean and free from burnt and blackened plastic. 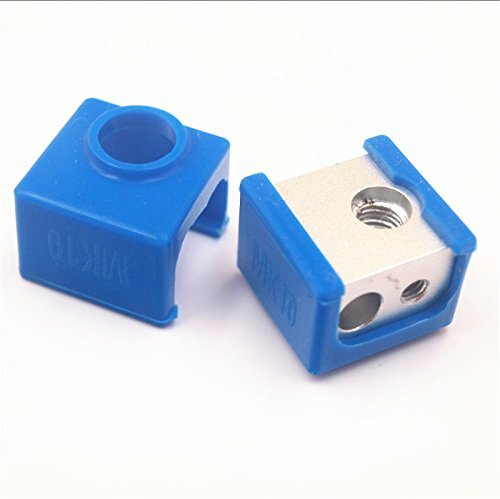 They don't just keep the block clean, but also keep heat inside the hotend and off your print. Helps to keep the hotend temperature extremely stable, particularly if you use high-airflow cooling around the nozzle to cool the print. The covers simply push onto the front of the HotEnd with no disassembly - they will be a tight fit when first pushed on cold. When hot the silicone will expand to the correct size to fit the hotend snugly. Please kindly note: we suggest highest safe temperature resistance is about 230℃-250℃/ 446℉-482℉. If you have any questions about this product by Funssor, contact us by completing and submitting the form below. If you are looking for a specif part number, please include it with your message.